There is no greater major threat to public health worldwide than nutrient deprivation. Presently nutrient deficiency affects around 800 million people worldwide. Since time immemorial nutrient deprivation or overt starvation has caused organ dysfunction or death. Nutrient deficiency is not only the consequence of drought, famines, or civil upheaval. Malnutrition may arise for a number of reasons. For example, some studies have reported that in hospitals as many as half of patients may be malnourished or at risk of malnutrition. The term malnutrition however is very broad and covers undernutrition, imbalance, and overnutrition. This book focuses on the former two umbrellas and coverage ranges from cellular events to public health policies. The detailed molecular events arising from nutrient deprivation are relatively recent discoveries in the overall time scale of research into malnutrition. At the other end of the spectrum, public health policies are constantly being updated to take into account prevailing social, geographical, political, and economic profiles of communities and countries. Within this are policies which encompass future trajectories which aim to prevent famines or undernutrition. Thus there is a complex continuum of knowledge that stretches from our understanding of how molecules in cells behave to the imposition of policies. 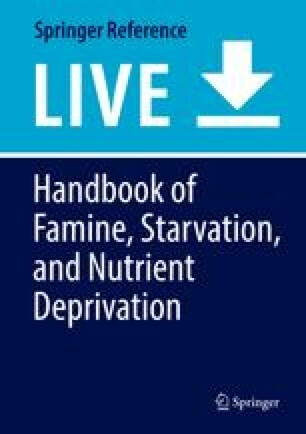 To further aid colleagues in the acquisition of this knowledge, this chapter lists the resources on the regulatory and professional bodies, journals, books, and websites that are relevant to an evidence-based approach to famine, starvation, and nutrient deficiency, from cells to policy. Nutrient deprivation is a major threat to global public health. Starvation is the most extreme nutrient deprivation. It results from severe restriction of dietary energy and macro- and micronutrient intake below that needed to sustain life. Accurate data on the extent of starvation is relatively difficult to obtain. However, less severe nutrient deficiency affects around 815 million people on a global basis (Food and Agriculture Organization of the United Nations et al. 2017). Famine has caused starvation and nutrient deprivation in humans since time immemorial. However, the understanding of the molecular changes relevant to the effects of worsening nutrient deprivation is relatively recent discoveries in the overall time scale of research in this field. It is important to remember that nutrient deprivation arises in a number of scenarios other than due to famine per se. These include undernutrition due to illness, poverty, societal imbalance, conflict, self-starvation, and so on. Nutrient deprivation is under-recognized in modern medicine and to some extent does not receive the attention it deserves. For example, over 20 years ago, Powell Tuck (1997) highlighted that the prevalence of malnutrition in hospital patients is between 19 and 55% using various criteria. Despite this, undernutrition in the hospital setting still remains problematic (Kruizenga et al. 2016; Morris et al. 2018). The treatment of starvation and nutrient deprivation may seem obvious and straightforward. However, the relatively recent discovery of the phenomenon known as the refeeding syndrome underlines the importance of gradual replacement of the calorie deficit (Friedli et al. 2017). Yet although refeeding syndrome was described more than 70 years ago, there is still no standard definition or recommendations for its prevention or treatment (Friedli et al. 2017). Regardless there has recently been an explosion in the knowledge and understanding of nutrient deprivation and starvation. It is now difficult even for experienced scientists to remain up-to-date. To assist colleagues who are interested in understanding more about this field, we have therefore produced tables containing up-to-date resources in this chapter. The expert who assisted with the compilation of these tables of resources is acknowledged below. Tables 1, 2, 3, and 4 list the most up-to-date information on the regulatory bodies and professional societies (Table 1), journals on nutrient deprivation (Table 2), books (Table 3), and online resources (Table 4) that are relevant to an evidence-based approach to nutrient deprivation. Biology of Starvation in Humans and Other Organisms. Merkin TC. Nova science publishers, 2011. Comparative Physiology of Fasting, Starvation, and Food Limitation. McCue MD. Springer, 2012. Diet, Nutrition, and Fetal Programming. Rajendram R, Preedy VR, Patel VB (editors). Springer, 2017. Essentials of Pediatric Nutrition. Samour PQ, king K (editors). Jones & Bartlett Learning, 2013. Global Child Health. Subrahmanian K, Swamy P. Springer, 2018. Malnutrition in Chronic Diet-Associated Infantile Diarrhea: Diagnosis and Management. Lifschitz CH (editor). Academic press, 2013. Molecular, Genetic, and Nutritional Aspects of Major and Trace Minerals. Collins JF. Academic press, 2016. Nutrition in the Prevention and Treatment of Disease, 4th ed. Coulston AM, Boushey CJ, Ferruzzi M, Delahanty L (editors). Elsevier, 2017. Pediatric Nutrition, 4th ed. Samour PQ, king K (editors). Jones & Bartlett Learning, 2012. Practice-Based Nutrition Care, An Issue of Medical Clinics of North America, Kahan S, Kushner RF. Elsevier, 2016. Present Knowledge in Nutrition, 10th ed. Erdman JW, Macdonald IA, Zeisel SH. ILSI press, 2012. Protein-Calorie Malnutrition. Olson R (editor). Academic press, 2012. Searching for Medical Truths. Metabolism in health and disease states: Obesity, alcoholism, diabetes and starvation. Owen OE. Infinity publishing.Com, 2006. Starvation: New Insights for the Healthcare Professional. QA Acton. Scholarly editions, 2012. The State of Food Security and Nutrition in the World 2017. Building resilience for peace and food security. Food and agriculture Organization of the United Nations (FAO), the International Fund for Agricultural Development (IFAD), the United Nations Children’s fund (UNICEF), the world food Programme (WFP), and the World Health Organization (WHO). FAO, Rome, 2017. The Vitamins: Fundamental Aspects in Nutrition and Health. Combs Jr. GF, McClung JP. Academic press, 2017. Nutrient deprivation is a major threat to global public health. Starvation is the most extreme nutrient deprivation. Nutrient deprivation is under-recognized in modern medicine. Nutrient deprivation arises in a number of scenarios other than due to famine, in illness, poverty, societal imbalance, self-starvation, etc. This chapter lists resources relating to the regulatory and professional bodies, societies, journals, books, and websites that are relevant to an evidence-based approach to nutrient deprivation, starvation, and famine. We would like to thank the following author for contributing to the development of this resource. Dr Valeria Galetti.